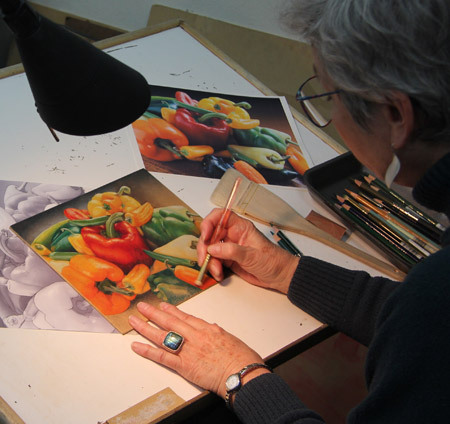 Master the Fine Art of Colored Pencil with Richard Drayton! The humble colored pencil has finally come into it’s own as a recognized fine art medium. This wonderful medium requires no water, no turpentine, no harsh chemicals or complex procedures of any kind. They don’t dry out or go bad when not in use and are easy to store. In my classes and workshops you will learn how to create rich, vibrant color and value using Prismacolor Fine Art Pencils. These pencils have a soft wax-based pigment that can be applied in a painterly opaque fashion. The basic technique is known as “burnishing”. This involves a careful layering of color, building up to the opaque and smooth application of pigment. The process is more like painting than a drawing and the resulting finished art is actually a “painting”. The workshops and classes will also cover basic drawing and painting principles, as well as learning to work from photography. Both novice and expert students are welcome and will be encouraged to explore their creativity while working on a project of their own, or choosing among those offered. 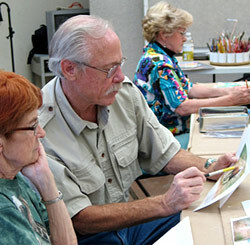 Classes and workshops are conducted at Sedona Arts Center in Sedona, Arizona. Individual instruction is also available – please contact Richard directly if interested in private lessons. Richard is represented in Sedona by the Sedona Arts Center Gallery. Richard will be having the following 2 day workshops at Sedona Arts Center. Workshop meets 9am–4pm each day with a one hour lunch. upcoming classes delivered to your INBOX! 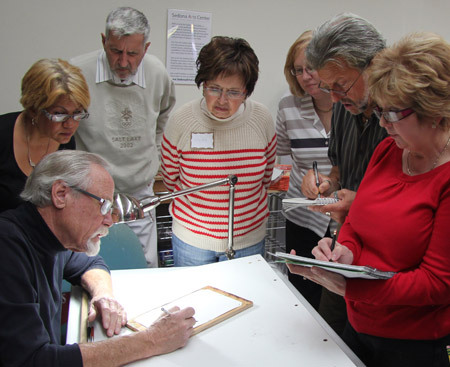 My colored pencil workshop brought together a wonderfully enthusiastic and dedicated group of artists! For the first-time students that joined us, the focus was on learning my technique of blending colors to achieve a high level of richness and saturation and a truly painterly effect with Prismacolor fine art pencils. I provided several different image and color blending exercises designed to expedite the learning process, and my returning students continued to hone their skills on one of these or a project of their own. As usual, I had the most fun……working with each student individually and as a group….answering questions and getting to know everybody while sharing some of the secrets of creating a high performance visual experience. My thanks to everybody for all of these kind remarks and allowing me to have so much fun! “Thank you for your great teaching style that made me feel more secure about it all. I learned more than I ever learned in many other classes”. “Amazing class. I so enjoyed it”. “Class was a blast! I felt so inspired. Thank you for being such a fantastic artist and teacher”. “Thank you so much for a fabulous class. Your teaching style is wonderful and I especially appreciate your patience with all your students, even when they ask as many questions as I do. So often people who have extraordinary talent in a given area do not make good teachers. You certainly do not hold to that model. The five of us from Phoenix agreed on the way home that we had garnered more jewels from you in two days than we had in any other class or seminar we have ever taken. I look forward to coming to Sedona for another class”. “The class last weekend was excellent. Thank you very much”. Sign up for Richard’s Newsletter and get info on upcoming classes delivered to your INBOX!